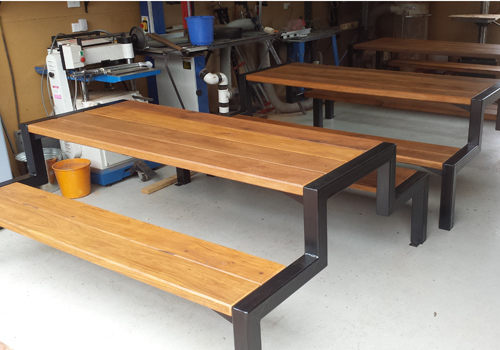 Simple and stylish timber and steel framed commercial and domestic picnic tables. 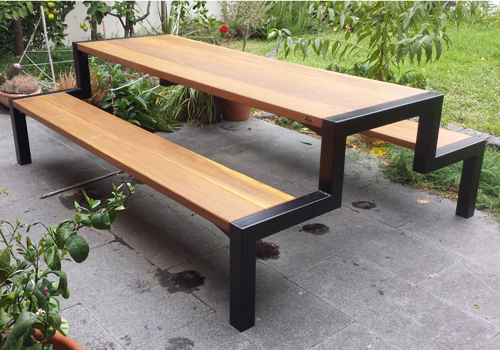 This smooth line, simple but modern picnic table will enhance any courtyard. This is ideal for both backyards and commercial public areas. 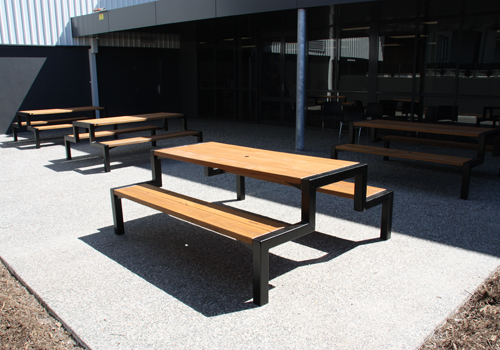 The steel frame picnic tables blend in perfectly with minimal componentry to obstruct walkways and are easy to maintain. The table tops and seats are solid (not laminated) timber boards/sleepers which are extremely durable. The simple but stylish steel frames, available in 2 styles, are a one piece welded unit. In summer the timber seats and table tops are much cooler to sit on than full metal tables and there is a natural beauty about timber that metal just doesn't have. The ultimate in strength and durability and functionality. The table top is 750mm wide and seats are 350mm wide each. The frames are made from 75mm square RHS steel, 3mm thick and fully welded on all joins. The steel is first sprayed with a primer and then top coated with 2 coats of a black satin finish. The timber boards are solid sections of timber 42-45mm in thickness, that has been dressed smooth with a light bevel on all edges. The boards are coated with 2 coats of Cabot's oils. The table is fully screws together from underneath with galvanised coach screws and is supplied assembled or in a flat pack KIT form. Table weights range from approx 130 - 190kg, depending on the timber choice. Available in 2 designs, 'A' or 'H' profiles. These tables can be made from a large range of timbers, each with a very different characteristic. The timber species selected is the major difference in the cost factors. Timber characteristics, availability and cost. *Usually Available means that it may take a while to source these timbers. We only carry a limmited quantity. Volume discounts apply and other sizes can be manufactured. Please note that a standard delivery fee applies, however pick up of the Kits is obviously free.